UTSA Special Collections staff was sad to learn of the recent passing of Helen Cloud Austin on February 22, 2016. Special Collections had a long relationship with Austin, beginning in 1997 when she donated the first portion of her papers to the University. 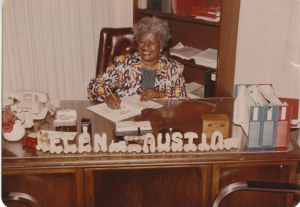 However, prior to 1997, Austin had already completed a prolific career in social work in San Antonio and beyond, earning local and national recognition for her dedication.